This summer, we selected the Frank Simmons Band from Hank Lane Music for our daughter’s wedding. I can say with 100% certainty that The Frank Simmons Band was the best decision we made when planning the wedding. According to our guests, it was THE BEST WEDDING EVER. Is there anything else I need to add? I think not. The guests were on the floor all night! 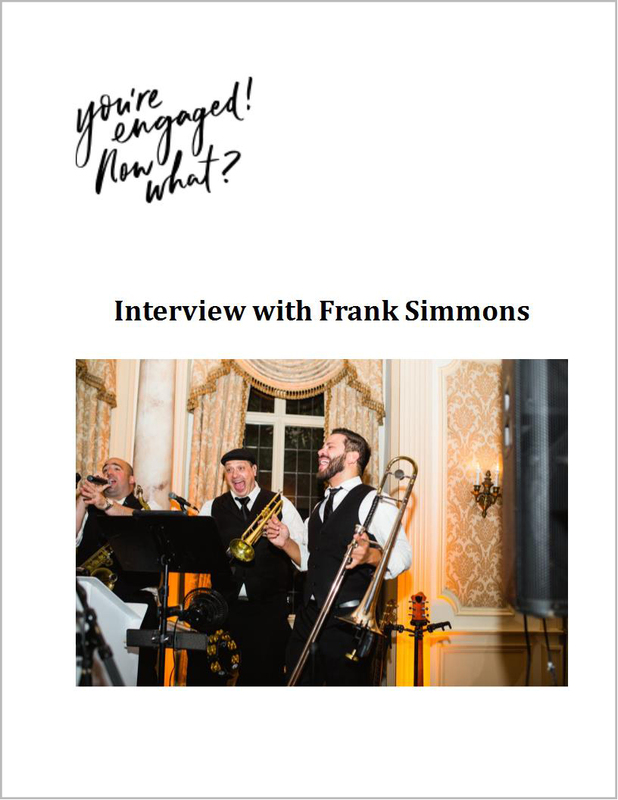 Since Frank and his band were so integral to the success of our daughter’s wedding and the whole purpose of this blog is to guide couple’s decision making for their upcoming wedding, I realized I wanted to interview Frank. This way, his band will be at the front of your mind when planning! YENW: PLEASE SHARE WITH US WHERE YOU GREW UP, WHERE YOU WENT TO SCHOOL, YOUR FIRST JOB IN HIGH SCHOOL. FS: I was raised in Wayne; NJ and it is also where I currently reside. I was very fortunate to grow up in an area with a rich musical background. At Wayne Valley High School, I had excellent teachers throughout school that helped mold me into the musician that I am today. I was a very involved, but being both an athlete and a musician was difficult to manage. Football and wrestling almost always had a conflict with marching band and jazz ensemble. Eventually, I had to make a choice of where I wanted to devote my time, and music won. Looking back years later, I realize that I made the right decision. I ended up marrying my fellow drum major and longtime girlfriend eight years after graduating high school. Outside of school, I played original garage rock bands. In the 90’s, the ska music scene was a big deal. Here in Wayne, we had a major “venue” called Skaters World. It was a skating rink, with an arcade and sold terrible pizza. All the elementary students would have their 5th-grade parties there, but at night it turned into a music venue, and this place was the hub of local original music and musicians. No matter whether it was a new band playing or a more seasoned group performing, there would always be a crowd of people there ready to cheer and dance. When the smoke cleared and everyone left, the bands got a small portion of the door revenue leaving each person with around $20. It wasn’t much money for a high school part-time job, but it kept me from spending money on weekends and still gave me the opportunity to go out and have a great time. FS: When I was 16, I was in an original band called The Offbeats. Shortly after recording an album with a small independent record label, we were approached one night after a show by a promoter. We were given the opportunity to open for a major touring ska act, The Mighty Mighty Bosstones. It was the first show we played where we had a crowd of a few thousand people, and while we were basically unknown beyond our local scene, it was the first real stage I performed on that made me feel like a rockstar. That night was easily one of the best experiences I had in my young life. YENW: PLEASE TELL US HOW AND WHEN THE FRANK SIMMONS BAND WAS FORMED? FS: After high school, The Offbeats broke up and we all went our own ways to different colleges to figure out what the next big life move. I studied music and after college decided to put my sax down for a while and explore some other opportunities. Suddenly it was 2007, and I was married and trying to figure out what my life’s direction should be. My wife threw me a surprise birthday party at the Shannon Rose in Clifton where there was a cover band playing. I noticed a crowd of a few hundred-people singing along to every song, and I heard the bartender say how everyone loved this band who is playing. She also mentioned that it was amazing that it was the only job the members had. I thought to myself, “I can do this too.” Since my wife and I were in a more financially stable situation, I asked her what she thought of me taking a shot to make music my full-time job. Since she had always been my rock, she was completely behind me to start a band from the ground up and make it happen. The first phone call I made was to my high school bandmate and friend Billy. I wanted to start a new band, and he had some experience in the wedding world as a performing vocalist and pianist. We started making calls and putting a group together. Within a few months, we were signed to a local agent and proceeded to play in shows throughout New Jersey. Over the next two years, we honed our craft and became extremely popular in the cover band scene. The unfortunate part was that while we were performing every weekend, it still wasn’t enough to support a family. Around that time, we hired a singer who let us know about the company he was working for, Hank Lane Music and Productions. Shortly thereafter, we found ourselves with an audition for Michael Hart at the company’s Long Island office. Michael took me on a few jobs to see how to successfully manage a wedding, and I was completely blown away. My band was good, but his band was incredible. It gave me a further perspective on the work I was going to need to put in to take my band to the next level and be able to fit in with this talented group of musicians. Michael let us know that the company had opened an office in New Jersey and needed new bands, so we started working for Russ Bennett of the newly established NJ office. Like Michael, Russ took me under his wing and imparted the knowledge he had collected over his many years of being a successful band leader. We shot a video and the Frank Simmons Band officially came to life. YENW: WHAT WERE YOUR FAVORITE BANDS GROWING UP? WHAT DO YOU LISTEN TO NOW? THE LAST CONCERT YOU WENT TO? YOUR MUSICAL INSPIRATION? FS: Growing up I listened to a lot of different music. My mom loved Billy Joel, and that was always on the radio. I loved the sax on his albums, and my mom recalls me being 4 years old pretending to air sax the Richie Cannata solos. In middle and high school, I was really into ska, jazz, and the Dave Matthews Band. It wasn’t until I started working for Hank Lane that I hit my latest obsession. Several years back, we had a client that requested Bruce Springsteen–a musician in Jersey who doesn’t know every Bruce Springsteen tune, crazy right? –and the requested song was “Rosalita.” The band gets the request information for our weddings in advance so we can rehearse everything to make sure it’s perfect for each wedding. At rehearsal that week, we got to the sax/guitar solo in the middle of the song, and then I was hooked. This guy’s music was incredible, and over the years we’ve learned quite a bit of his catalog. We spent a few hours really learning “Rosalita”, and after we performed it, I honestly thought we bombed the song because all I heard from the crowd was “Boooooooo”. My trumpet player turned to me and gave me a high five. Confused, I said, “They’re booing us,” but then he explained that they were all saying “Bruuuuuuuuuce.” From a Bruce fan, that may be the highest form of a compliment as it meant that we had just done the Boss justice. I finally was able to see Bruce in concert last August with my boss, and friend, Ian Magid, who had an extra ticket. As a working musician who is playing every weekend, it is usually really hard to make it out to see concerts, so I jumped at the chance to join him. As someone who had just really gotten into the Bruce catalog, it made it better to experience my first show with someone who is an absolute fanatic. Seeing someone else’s love of Bruce’s music really shows to me the kind of passion I need to put into all the music we learn that we are going to perform. YENW: WHAT IS YOUR FAVORITE THING ABOUT PLAYING IN A BAND AT WEDDINGS? FS: Throughout the years, I’ve tried to take these experiences and find the best ways to bring them to my stage. My goal was to create a high energy band that plays great music and makes sure that everyone is having an incredible evening. The wedding industry is unique in that 99% of the crowd each night has never seen us perform previously. I love that we get to make that impression on new people at every wedding. On top of that, we’re invited to be a huge part of someone else’s life by providing the music for their wedding celebration. Nothing in the world feels better than when I have a client come up to me after the event is over–They are usually sweating, out of breath and just have that smile on their face because they are exhausted and have just been dancing for four hours. I am very fortunate that I found a great agency like Hank Lane to have signed with. They helped me realize the dream of being a full-time performer. I love my band, my job, and the clients I work for. I look forward to seeing a lot of repeat faces in the future as we do their siblings and friends parties. I’ll see you all on the dance floor! FS: Back in college, I had the opportunity to play in an original band and used to perform a song that required me to play two saxophones at the same time. P.S. Bruce, if you’re reading this, and need a sub for Jake Clemons on a Tuesday or Wednesday at the stadium…I can cover the gig, it would be a major check mark off the bucket list. Frank, thank you so much for the generosity of your time in answering these questions. Such a pleasure to learn a little bit about you. We would gladly come to any stadium in NJ to watch you play on a Tuesday or Wednesday night with Bruce!